The Origami Flower Stem is a great little model, in that it allows any flower to stand up by itself, so you don't need a vase. As long as the paper flower has a hole in its base for the stem to be put into, in can be used for any flower. For a printable pdf version of the flower stem instructions, click here. You will need Adobe Reader installed on your computer in order to open the .pdf file. You can get Adobe Reader here. 1. Start with a green square of paper, white side up. Fold in half, crease and open. 2. Fold these 2 opposite corners into the centre crease. 3. Fold these outer corners to the centre crease. 4. Again, fold outer corners to centre crease. 5. Turn model over and fold bottom up to the top corner. 6. Now fold in half. 7. Crease as shown, on the front and the back. Then use these creases to outside reverse fold the leaf. Finished Flower Stem. This model should stand on its own. The flower stem an be used for any origami flower which has a hole in the base, such as the tulip. Just insert the stem into the base of the flower. 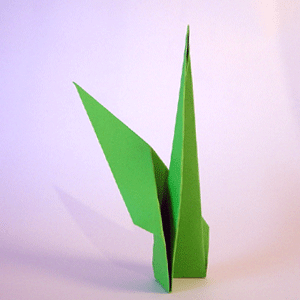 For more diagrams like the Origami Flower Stem, click here.